Remember back in April, when excavators finally unearthed thousands of lost E.T. 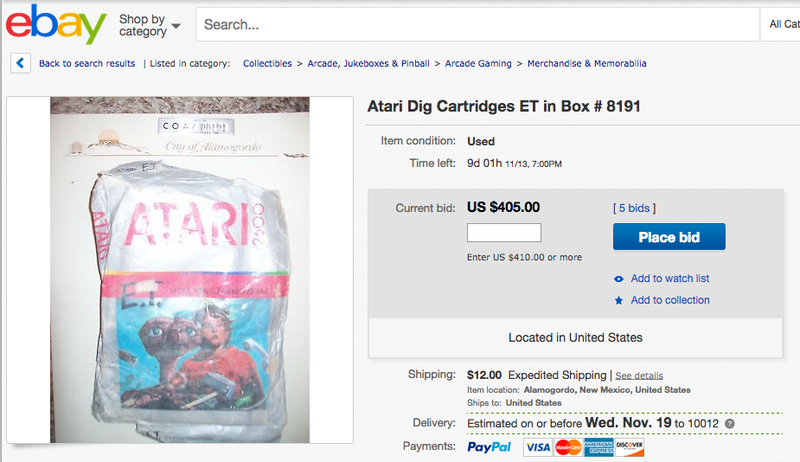 The Extra-Terrestrial video game cartridges for Atari 2600? Well, you can finally own one of them… if you've got a extra few hundred bucks. The first of the cartridges from the Old Alamogordo Landfill—official number 8191—just appeared on eBay this week. It looks terrible. As it has been buried under trash since 1983, it's all smashed and surely sort of dirty. The seller will also not say if it works or not. (It almost certainly does not.) The cartridge does come with a certificate of authenticity from the City of Alamogordo, an official property identification tag with official number 8191 on it, and some photos from the excavation.